This Easter I decided to mix it up a little and modify the traditional Easter dinner and NOT make ham! 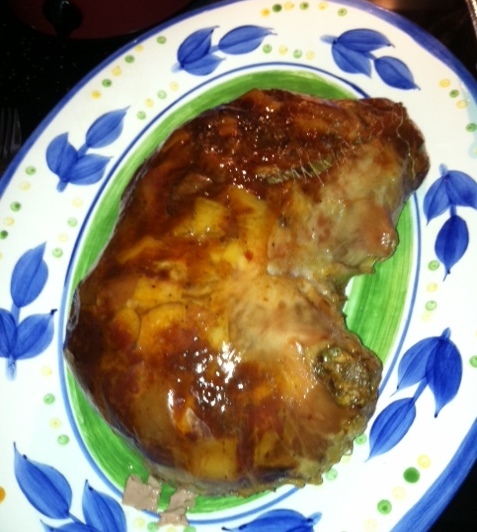 This year I made Hog Maw, or pig’s stomach, a traditional Pennsylvania Dutch dish. My Grandma made it all the time and it was fantastic! So, before I go any further and you decide to stop reading because it just seems too disgusting, think SAUSAGE casing. Except here, you use a pig’s stomach, which I do not eat!!! My son’s do, but not I! Be brave, the pictures below are not really pretty. 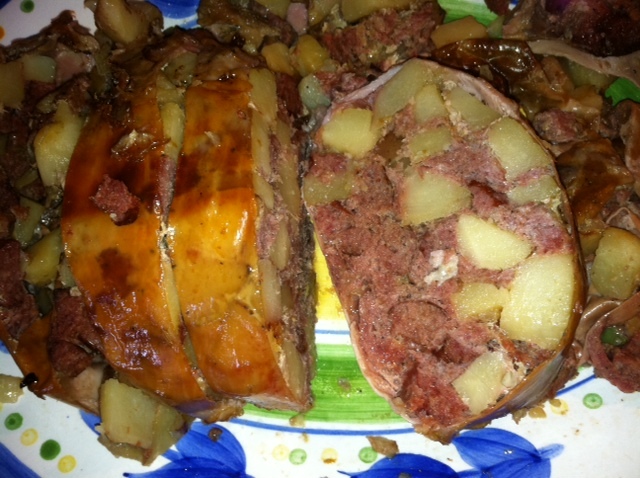 The stomach is stuffed with sausage, diced potatoes and onion. My Grandma added cabbage, I do not . I have since heard of other locals in my area using other variations such as a bread dressing that you would use to stuff a turkey, sliced carrots, apples. Really, you could use anything your little cravings desired. Although I would not recommend chocolate, THAT would just be wrong. A little history on Pennsylvania Dutch; they were not Amish, or Dutch, but rather a German descendant that settled in PA a very long time ago. In addition to Hog Maw, other traditional PA Dutch dishes were slippery pot pie, apple or corn fritters, rhubarb pie, potato cakes, and scrapple (keyword… scrap) which my Dad fried and smothered with molasses, schnitz un knepp, and the most delicious….Funnel Cake and Sticky Buns!!! I am sure many of these dishes were also part of other cultures as well since way back then, they were all farmers. And, the PA Dutch had their own language. My Mom’s family spoke it often when I was around them, clearly it was an adult conversation that I was not meant to hear. Recently I learned that a volunteer where I work speaks PA Dutch, and often comes in my office and rattles something that sounds somewhat familiar and comfortable. 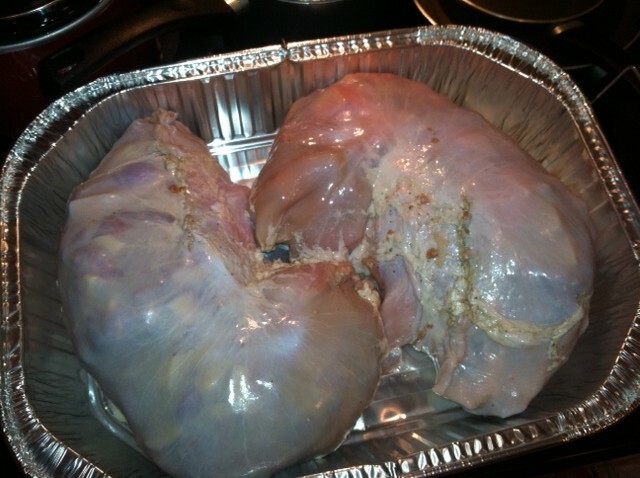 So, here come a few pictures, not for the weak of stomach (no pun intended). 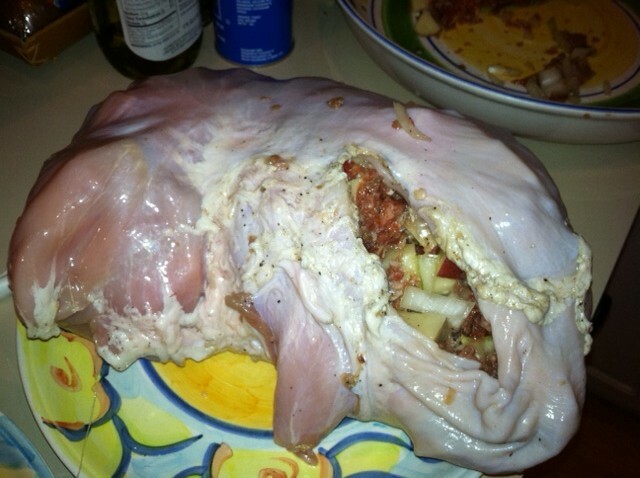 View at your own risk but let me tell you my Easter dinner was a delicious! I have very little leftovers. For those of you that are not local or familiar with south central PA, where I live, we have, as I am sure many other towns have, “Markets”. Not to be confused with a grocery store, but lovely vendor stands with produce, butchers, bakers, crafts, sandwiches, and yes, a wine stand (*insert happy face). Several of the bakers and butchers are run by Mennonites, they wear the cute little net bonnets. That is where I purchased my sausage and pig’s stomach. And I’m thinking in my conversation with the woman that took my order, she wasn’t quite sure I knew how to make this traditional dish as she wished me well and said that she hoped it would turn out for me. I purchased 2 pig stomachs, and you must make sure they are “cleaned”. I don’t mean washed cleaned but rather cleaned of the lining inside the stomach. Not knowing exactly how big they would be since I have never purchased them from this butcher, I bought way too much sausage. I used 3 different sausages this time, fresh, smoked and Italian. I know, Italian sausage in a traditional PA Dutch dish? Shocking yea, but I’m a rebel, what can I say. I bought 2-1/2 pounds of fresh (loose, not in casings), 1-1/2 pounds of smoked sausage and 1-1/2 pounds of Italian (again, loose, not in a casing). And a 5 pound bag of red skinned potatoes. I left the skins on the potatoes, just wash them well and cut out any imperfections, then dice. My Grandma would never have left the skins on but yanno, it’s the rebel in me. Or is it laziness??? Dice a whole large onion. Mix with the potatoes and salt and pepper well. I did a very light drizzle of olive oil but again, it’s not what my Grandma did. In a separate bowl mix the sausage. Now, I didn’t use all of the sausage at one time. After I judged the size of the stomach, it sort of doubles when they are stuffed, I just started grabbing handfuls of sausage until I got the combination that I wanted. I cut and cubed the links of the smoked sausage as that can only be bought in links. Then I mixed the potatoes and the sausage together. Salt and pepper the inside of the stomachs and start stuffing. Cram it in there! It needs to be a firmly packed. 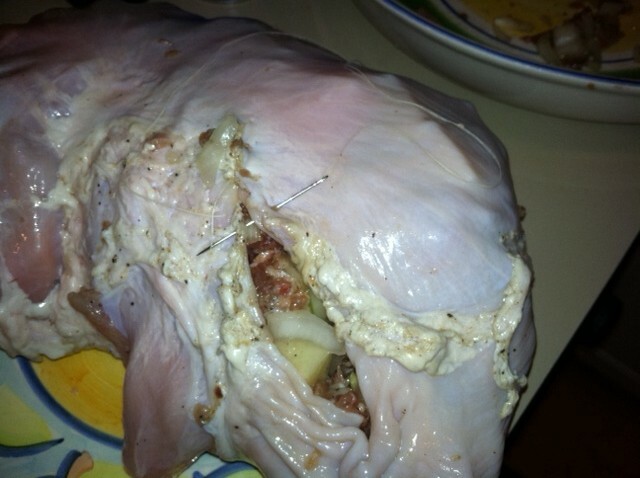 After they are stuffed, you get to stitch the opening closed. I have always used a sewing needle and white thread and it has always worked for me. Just remember to remove the tread before you slice it. I put both of the stuffed stomachs into a roasting pan and added just a small amount of water to cover the bottom of the pan, cover tightly with foil. Bake at 350 for about 4-5 hours, until the potatoes are tender. Usually you can tell by poking it with a knife! About 2 hours into the baking, check to see it has not cooked dry. Add more water if needed. I’m sure you could use a chicken or beef stock if you so desired, some folks make a gravy with the drippings but it just seems too greasy for me. Remove the foil about the last hour of baking to brown the skin. Baste as you watch it, you don’t want it to burn. AHH browned perfectly! My boys loved the crispy skin! Remove the thread, slice and serve and be prepared to be knocked off your feet cuz it’s good!!! If you have never ever had Hog Maw, I hope you are tempted to try it.